It was an ambitious project that would unify several European currencies into a single currency, a standard coinage that could be used throughout the member states. It would facilitate trade and tourism and promote peace and unity throughout the Union. 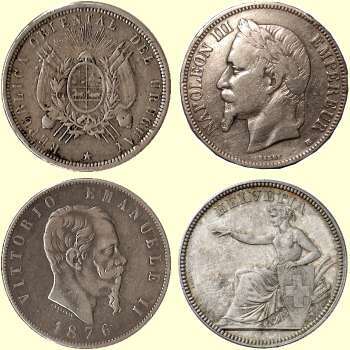 It featured standardised coins, differentiated only by national symbols but otherwise boasting the same dimensions and weight. And, ultimately, it failed, members reverting to issuing their own coinage once more. Despite the extensive press coverage of the troubles facing the Eurozone, this is not an obituary for the European Single Currency. It is the story of its direct antecedent, the Latin Monetary Union. On 29 December 1865 a monetary convention between France, Italy, Belgium and Switzerland concluded in Paris. The resulting treaty would be ratified on 19 July 1866 and came into force on 1 August 1866. The treaty formed the Latin Monetary Union, which saw each member state agree to change their national currencies to a standard of 4.5 grams of silver or 0.290322 gram of gold and make them freely interchangeable. The Union was enlarged by the admittance of Spain and Greece in 1868 and Romania, Bulgaria, Venezuela, Serbia and San Marino in 1889. The collapse of the Latin Monetary Union has clear lessons for today’s Eurozone leaders. One reason for its failure was the tendency of member states to bend the rules and produce coinage that was not up to scratch. Greece was ejected from the Union in 1908 after reducing the amount of gold in their coins. The most scandalous abuse of the system was from the Papal States, whose treasurer, Giacomo Cardinal Antonelli, oversaw minting of far more coins than they were permitted under the system. Another factor was the rigidity of rules imposed, specifically the Union’s standard exchange rate of 15.5 ounces of silver to 1 ounce of gold. A combination of new finds and improved mining technology decreased the value of silver, making it profitable to exchange at the fixed rate for gold. Finally, the other great powers of Great Britain, Germany and the USA resented the French leadership of the Union. They preferred a more apolitical and neutral gold standard, a monetary system that would survive, more or less, until 1971. So the Latin Monetary Union was doomed to failure and, in practice, this came with the outbreak of the First World War and the resulting fiscal pressures on its lead members. It survived on paper until the 1920s, and was finally officially laid to rest in 1926. The Latin Monetary Union is not the only example of a currency union. In 1873, Denmark, Norway and Sweden founded the Scandinavian Monetary Union. This created a fixed exchange rate for a new currency, the krona, based on gold. Just like the Latin Monetary Union, the system collapsed under the pressures created by the First World War. the Eastern Caribbean Currency Union (which sees the East Caribbean Dollar used in Antigua and Barbuda, Dominica, Grenada, St. Kitts and Nevis, St. Lucia, and St. Vincent and the Grenadines). There are also concrete plans for the Khaleeji (a common currency for Bahrain, Kuwait, Oman, Qatar, Saudi Arabia, and United Arab Emirates), the East African shilling (covering Burundi, Kenya, Rwanda, Tanzania, and Uganda) in the East African Community and the Eco, under the West African Monetary Zone (Gambia, Ghana, Guinea, Liberia, Nigeria and Sierra Leone). Michael Bergmann, Stefan Gerlach and Lars Jonung “The rise and fall of the Scandinavian Currency Union 1873-1920”; European Economic Review 37.